Craft your own arcade cabinet of Cursed Castilla! As you may know, yesterday was an important day for the team since we launched Cursed Castilla for Nintendo Switch. Although it is not our first console launch, bringing Castilla to the Switch is a milestone on itself that fills us with joy. We would like to thank you all for the enormous support given us every day and every release. Honestly, we are overwhelmed by the huge amount of positive comments and kind words we receive from friends, fans, players, and media. Both, the tandem Locomalito & Gryzor87 and Abylight, we firmly know we owe you a lot, so we would like to give some love back with a small but meaningful detail. We really hope you like it. 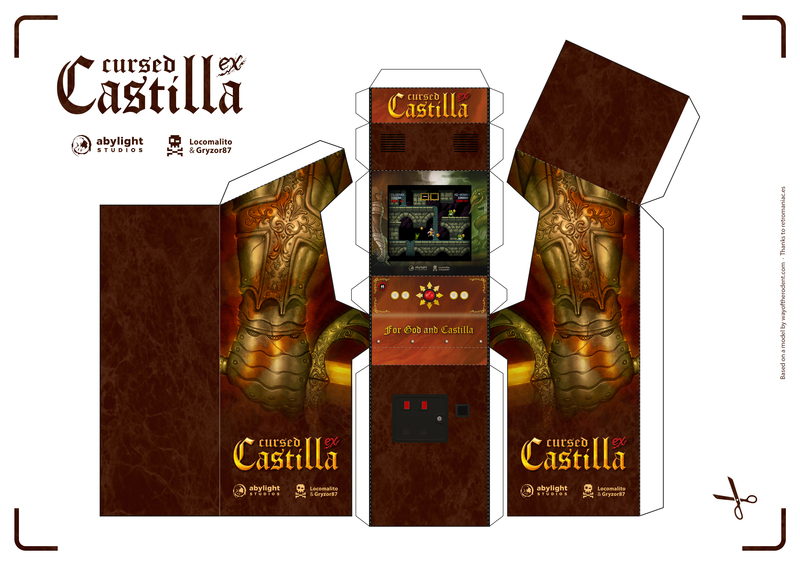 Inspired by the work of Tovar and our friends @RetromaniacMag, we want to make this DIY available in order to craft your own arcade cabinet of Maldita Castilla. You will only need to download the file, grab the scissors, glue and show a few skills. What do you think? Cute, right? In addition, those who follow our official Instagram account (@abylightstudios), Twitter (@abylight), and upload a picture of the cabinet put together with the hashtag #CursedCastillacabinet will be able to win (randomly selected) a code for the Nintendo Switch version of Cursed Castilla. The last day to send your photographs will be next Monday 28th at 23:59 h local time (Central European Time). We hope you like it and remember, even if you are not able or do not want to participate in the contest, we still would love to see your creation. Once again, thank you very much for your support! It means a lot to us. Tags: arcade, Gryzor87, indie, Locomalito, Nintedo Switch, retro. Check the last patch notes for Hyper Light Drifter on Nintendo Switch! Cursed Castilla for Nintendo Switch is OUT! Super Hydorah on Nintendo Switch got patched! Don Ramiro is back! Cursed Castilla release date for Nintendo Switch is up! © 2019 Abylight S.L. Trademarks are property of their respective owners.